This topic contains 30 replies, has 18 voices, and was last updated by Marc Smith 1 month, 3 weeks ago. Have an issue getting the data you need? Share the details here! Yes. i need to import facebook friend network data. Please suggest how it can be done. I am using “Twitter Users Network Importer” and I am trying to generate the network of “follows” relations of a set of usernames. I am curious what exactly the option “Limit friends and followers to: X” serves to, when I choose “Basic network plus friends”. – Is there an upper limit to this? – To put the question more generally, when I choose “Basic network plus friends”, how does Node XL generate “follows” relations? Does it send of query to the list of followers of each users or to the list of following of each user, or both? – When I choose “Import only the Twitter users I am interested in”, does Node XL limits to its queries only to the list of usernames I provide? In other words, when it is chose, does Node XL query only whether any two specified users follow each other or not, OR does it query the whole list of followers node 1, and checks whether node 2 is in the list or not? I have searched all over but could not find a satisfying/precise answer to my questions. This reply was modified 1 year, 2 months ago by mustafayavas. 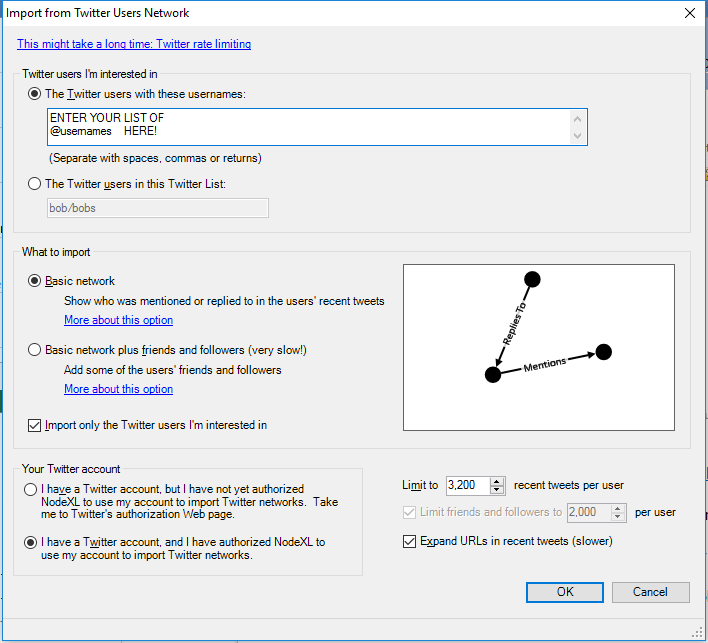 NodeXL Pro can import from Twitter in two ways. The search importer collects tweets containing a particular term. The Users import collects tweets from specified users. 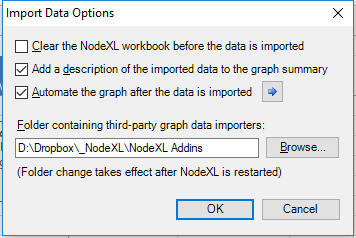 You may then import multiple data sets into the same workbook. Facebook’s API no longer enables access to the personal friends list. Facebook Pages and Groups are accessible. Recently, I have encountered an issue using the Twitter Users Network import. When an import is executed, the following error message appears “Either there are no such users, or they have all protected their Twitter accounts”. The error occurs regardless of searching basic network only or basic plus. Note: This error does not occur when importing via the Twitter Search Network. Thanks for the interest in NodeXL! Twitter’s API data volumes can vary based on factors internal to Twitter. NodeXL will execute the same calls every time, but Twitter’s results may vary. We do find that in some cases a delay of 24 hours will return the volumes delivered by Twitter to higher volumes. Only a commercial feed from Twitter can guarantee a sustained rate of data. These services are currently very expensive. If you would like to share the query you are running, I can try to replicate it here – perhaps I will get more data? Is it possible to find out all of someone’s followers and then the interactions between the followers and individual of interest? It is possible but it is also likely to be slow. Twitter applies additional limits to the Follows and Followers data query — it is “throttled” to a slower rate of data delivery than the other “Tweet” based queries. If you are patient it may be possible to do this collection. That said, it is often the case that one or two users in a list of followers are celebrities who have very large numbers of followers. It is not practical to collect many tens of thousands of followers in a desktop application. Millions are not viable at all. NodeXL Pro offers the ability to set an upper threshold (say 5000) on the number of followers that will be collected. Note that the typical Twitter user has about 200 followers (many of which are bots or spam accounts). In practice, the Follow network may not be as userful as the “SEARCH” network based on an active “Mention” or “Reply” from one user to another. A “Follow” may not indicate any awareness or exposure to the other user’s content. In contrast, Reply and Mention are stronger indicators of content exposure and engagement. Hi Marc, today I’m having trouble downloading Facebook Fan Page Data with NodeXL Pro. This is a problem that I didn’t have yesterday. Do you know what’s going on? Thanks! We are investigating and will release an updated version of the importers soon. It is not yet clear how much of previous functionality will be retained depending on what remains of the key API calls. [KeyNotFoundException]: The given key was not present in the dictionary. The last time I download fanpage network data was at February 2nd 2018. Does this happened because the recent changes of Facebook API like you mentioned above? If yes, then could I still get facebook fanpage network data in the future? When will the new NodeXL Pro updated version be released? I also would like to know why I never get user gender information when importing facebook fanpage network. Thank you for the interest in NodeXL. Facebook Pages and Groups are accessible to a limited extent. It looks like the Fan Pages are more affected than the Groups importer. The Fan Page importer looks like it no longer providers userIDs or reactions. Many of the “edges” NodeXL extracted from Facebook were based on these data elements. These edges will no longer be available due to the Facebook changes in the API. We are exploring ways of expanding on the existing Facebook Fan Page to Fan Page network collector – which still looks like it is available. Facebook is a commercial property and is not obliged to provide *an* data if it does not want to. That said, these recent changes to reduce data access reduce the credibility and desirability of Facebook as a platform for many kinds of users. I predict that a Premium Facebook “product” will soon emerge to sell back the data that we all contributed to Facebook for free. Hello, today, i’m have a problem in the facebook fan page import functionality. The error message is [KeyNotFoundException]: The given key was not present in the dictionary. I have trouble with Facebook social media importer, i can´t get data about likes and shares from fan page network, only comment data are available. See here: https://imgur.com/4AdDBss Are this data lost forever?